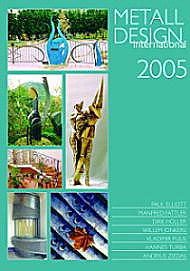 Metall Design International Books are the yearbook of Hephaistos. They are a praiseworthy annual project photographically documenting the work of several different master blacksmiths from around the world. Each annual has a brief biography of the smiths and a large number of beautiful photographs of their work. They contain hundreds of high-quality photos. Text in German and English. This yearbook is the "most youthful" of all those published up to now as we found two young blacksmiths in Lithuania and England which still are at the beginning of their professional career and nonetheless can look back on a variety of works like others after a decade. The book also has the courage to present two "outsiders" among the metal designers and to mention them in between the grand-masters of their craftsmanship. HEPHAISTOS presents: Paul Elliot (GB), Manfred Fattler und Dirk Höller (D), Willem Jonkers III. (Nl) Vladimir Pulis (SK), Hannes Turba (A) und Linas Lesciauskas (LIT).